Instructions: Heat a large nonstick skillet over medium-high heat. Add 2 teaspoons oil, and swirl to coat. Sprinkle fish with ¼ teaspoon salt and the pepper. Cook fish 5 minutes on each side or until fish flakes with a fork. Remove fish from pan; keep warm. Add remaining 1 teaspoon oil to pan. Add tomatoes and garlic; sauté 3 minutes. Add vinegar; cook 1 minute or until tomatoes begin to burst. Stir in basil and remaining ¼ teaspoon salt. Spoon tomato mixture evenly over fish. 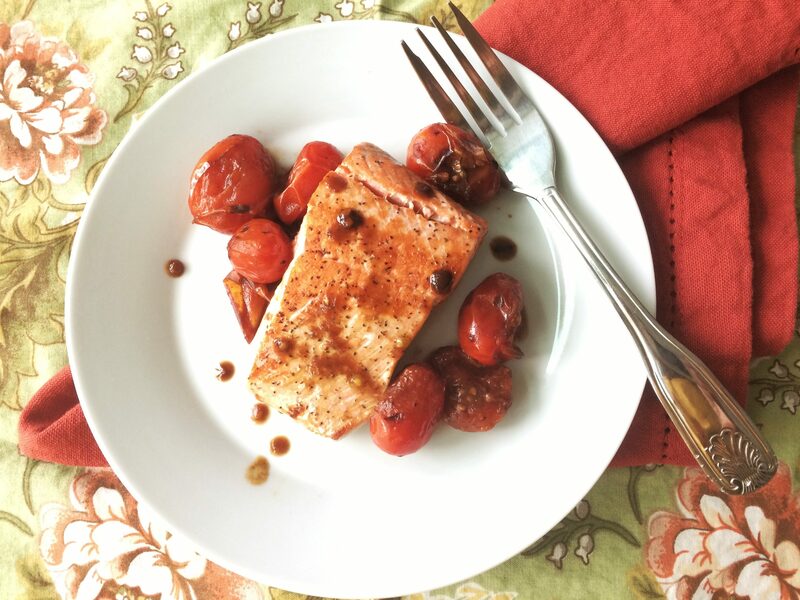 Note: Serve salmon and tomatoes with cooked quinoa or whole-wheat couscous for a complete meal.